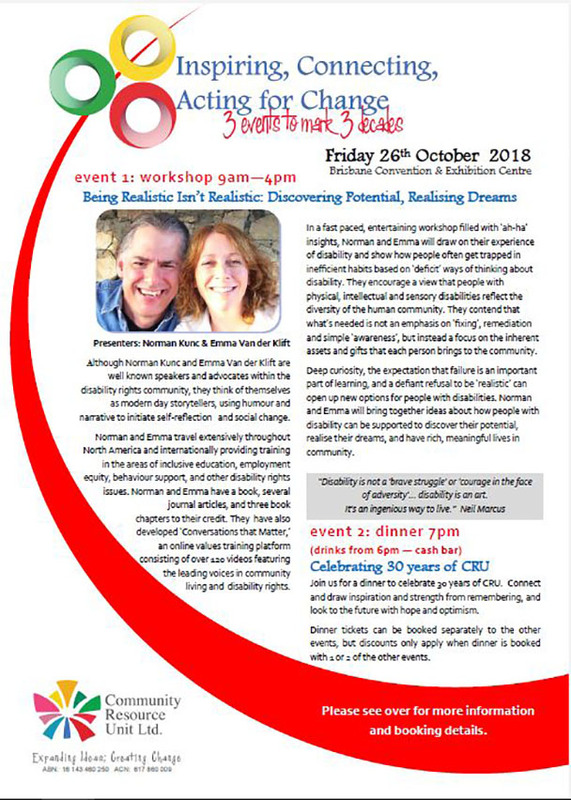 In a fast paced, entertaining workshop filled with ‘ah-ha’ insights, Norman Kunc and Emma Van der Klift will draw on their experience of disability and show how people often get trapped in inefficient habits based on ‘deficit’ ways of thinking about disability. 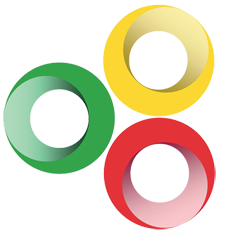 They encourage a view that people with physical, intellectual and sensory disabilities reflect the diversity of the human community. They contend that what’s needed is not an emphasis on ‘fixing’, remediation and simple ‘awareness’, but instead a focus on the inherent assets and gifts that each person brings to the community. Deep curiosity, the expectation that failure is an important part of learning, and a defiant refusal to be ‘realistic’ can open up new options for people with disabilities. 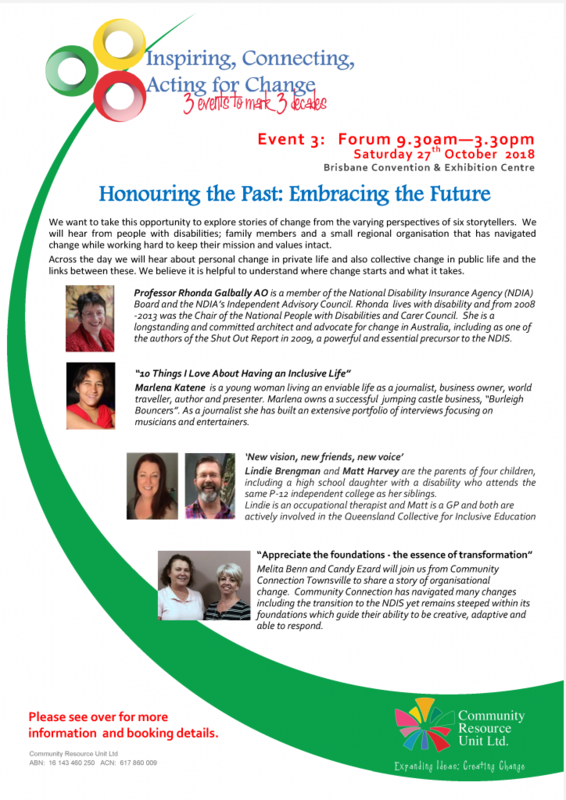 Norman and Emma will bring together ideas about how people with disability can be supported to discover their potential, realise their dreams, and have rich, meaningful lives in community. 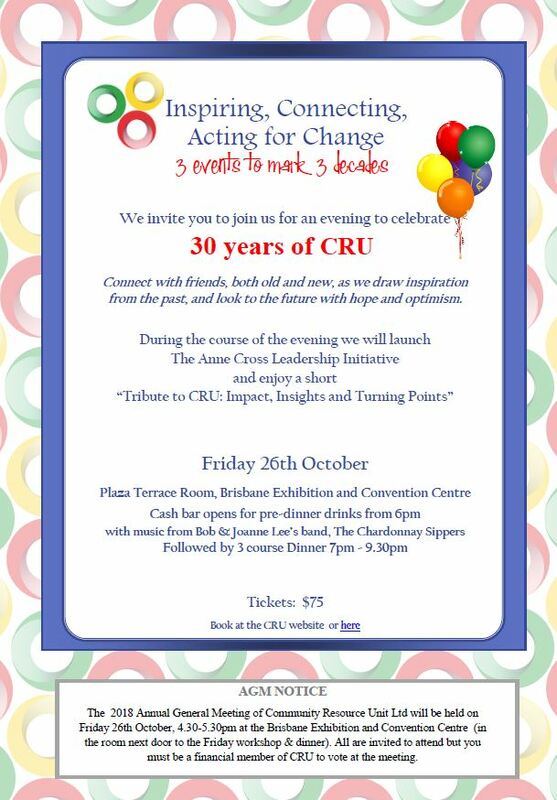 Join us for a dinner to celebrate 30 years of CRU. Connect and draw inspiration and strength from remembering, and look to the future with hope and optimism. Dinner tickets can be booked separately to the other events, but discounts only apply when dinner is booked with 1 or 2 of the other events. Dinner from 7pm, drinks from 6pm – cash bar. 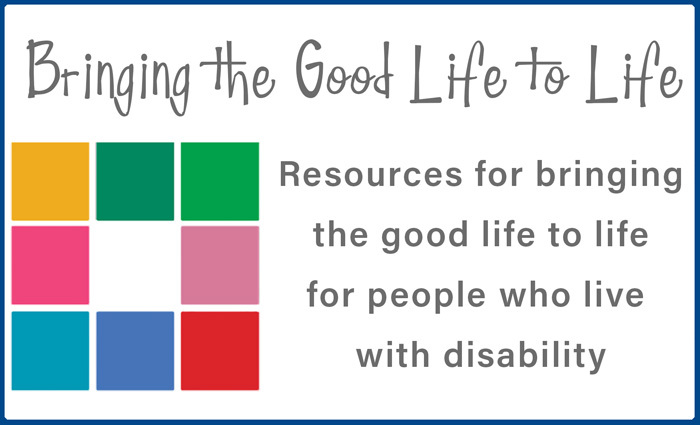 Through four rich and inspiring stories you will have the opportunity to hear people, just like you, describe practical day to day strategies that have made a difference to improve the lives of people who live with disability. From a range of personal perspectives, our speakers will explore how personal change links with public and collective change to make the world a better place. We trust that you will leave the sessions inspired and informed, as well as connected to more people working for change.